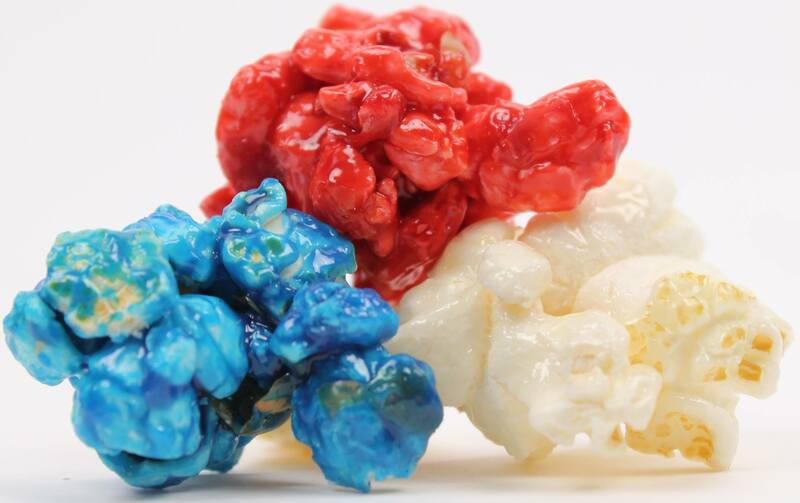 Yes, you can have custom colored gourmet popcorn. Do you need Pink for a new baby girl, Blue for a boy? Is your company logo Green and Purple? Whatever the reason and whatever the color, Kernel Encore can make the popcorn for you. Custom Colored Popcorn, is a perfect way to show off your company colors, school colors, or your favorite football teams colors. How about a wedding with a Blush Pink popcorn, or Blood red for Halloween. The flavor on the Custom Colored Popcorn is Old Fashioned Sugar Corn, which is just sweet with no particular flavor. That way everyone will like it. You can also choose from Custom Colored salted popcorn. The color is a lighter than on the sugar corn, but it still comes across as colored popcorn. Perfect to sell at the high school football game in school colors. There are many reasons to have a specific color, but whatever your reason is Kernel Encore has got you colored, whoops I meant covered. This entry was posted in Custom Popcorn and tagged colored popcorn, custom popcorn by KernelEncore. Bookmark the permalink.